Republicans are dead set on rolling back regulations passed to restrain Wall Street and big banks from repeating the kind of shenanigans that fueled the 2008 financial collapse. Rather than fight a losing battle at the federal level, advocates for a secure, accountable and transparent financial system should channel their energy in a different direction: chartering public banks in every state. The Bank of North Dakota is the model. Chartered in 1919, it is the nation’s lone public bank. It was set up, as the Wall Street Journal described it, “under a socialist-oriented government that represented farmers frustrated with out-of-state commodity and railroad owners.” Today, the Bank of North Dakota is hardly a socialist endeavor: By statute, North Dakota’s governor, agriculture commissioner, and attorney general — currently all Republicans — make up the bank’s three-person executive body. All of North Dakota’s state funds, its assets, are deposited in the bank. The bank then deploys the money in the form of loans often issued through smaller community banks. BND is primarily a “bankers bank,” not a retail bank. North Dakotans can open a checking account with BND but only by showing up at the bank’s single branch. There are no BND credit cards, ATMs or online bill paying services. The bank is specifically chartered to partner with, rather than compete with, commercial banks. Mostly, BND’s money goes to businesses, farms, municipal projects, home mortgages and student loans. Because it isn’t charged with making money for private shareholders but with supporting North Dakota’s overall economy, it charges low interest rates — as low as 1% in some cases. Its modest profit is still substantial — about $1 billion over the past two decades. The profits are returned to the state’s general fund or to the bank’s assets, which is to say to the people of North Dakota. Because the Bank of North Dakota focuses on down-home projects, not credit default swaps or other high-risk financial schemes, it remained stable throughout the Great Recession. Setting up a state bank is relatively simple: State legislatures pass a bill creating a bank, and mandating that state funds — or at least some portion of them — will be deposited in the new entity rather than in private banks. (Municipalities and counties can also set up public banks.) Public bank campaigns are active in 10 states, including an effort spearheaded by Public Banking Institute, a think tank and advocacy group, in California. Not surprisingly, state banks are bitterly opposed by major Wall Street institutions, which pour lobbying money into scuttling public banking legislation wherever it crops up. If states were to open public banks, the likes of Citibank, Wells Fargo and Bank of America would lose the billions of dollars those states now deposit with them. And if a city or a farmer borrows through a public bank rather than a Wells or a BofA, once again Big Finance loses. The need to rebuild the nation’s infrastructure might provide an opportunity to overcome big bank opposition to public banking. The high cost of building and fixing roads, bridges, airports and the like is only increased by the fees and interest payments charged by private banks and by bond issuers. Public banks could mitigate those costs. 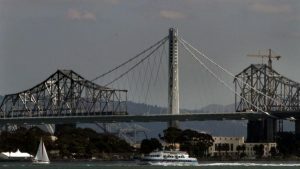 Consider the cost of the new Oakland-to-Yerba-Buena-Island span of the San Francisco Bay Bridge. It was completed in 2013 for a reported $6.4 billion. But the actual price tag will be more like $13 billion because of the interest payments on bonds privately capitalized through Wall Street institutions and their investors. For every dollar spent on the actual project, another dollar will ultimately go to paying off that debt. If a state bank had financed the project the interest and fees could have been lower to begin with, and they would have gone back into California’s coffers, not Wall Street’s. As the White House and Congress consider legislation covering an estimated $1 trillion of infrastructure spending, they could include an incentive to jump-start the formation of more state banks with just those kinds of savings in mind. One simple approach would be to mandate that all federal building projects must be financed at no more than say, 2% interest. Big banks would be free to participate although given their appetite for higher profits and higher interest rates, they might not bite. That would give states a formidable push to form their own banks to fill the gap. Federal infrastructure dollars could also be earmarked for deposit only in public banks. There would, of course, be a fierce battle against such a provision in a national infrastructure bill, but there ought to be a strong constituency for it as well. The interest savings alone should appeal to those members of Congress who regularly rail against unnecessary spending of public money. And encouraging the formation of public banks should appeal to other politicians who want to reduce the size of the “too big to fail” banks. State banks would inject a healthier, sustainable way of loaning money and collecting interest on it into the American financial system. They would make the lives of millions of people a whole lot better.